Good morning and welcome back! One proud thing: We’re celebrating — Axios was named “Best Digital News Start-up” at the 2018 North American Media Awards! Axios' Amy Harder and Chris Canipe report ... U.S. natural gas production has increased more than 50% since 1997, and prices have dropped to levels not seen since then. Why it matters: Natural gas prices are more opaque than gasoline prices you see driving down the street, but the fuel is actually more diverse and used in everything from home heating to electricity to industrial manufacturing. Unlike domestic gasoline prices that are driven mostly by a complex global oil market, natural gas isn’t (yet) priced on a global market. That means America’s increased production has resulted in lower prices, providing economic benefits across the board. One level deeper: America is ramping up its exports of natural gas in a liquified form (known as LNG), in response to the gas boom over the last decade. What's next: As of 2017, U.S. had 4% share of global LNG exports. The International Energy Agency says in a new report that's poised to grow to 20% by 2023. That’s a “very very big jump in such a short period of time,” Fatih Birol, the executive director of the agency, told Axios Monday. Birol predicts natural gas could likely to be priced on a global level like oil within the next decade. That could make America’s natural gas prices beholden to global markets much like gasoline prices are today. State of play: Oil prices are up following yesterday's claim by a senior State Department official that the U.S. doesn't intend to grant sanctions waivers for buyers of Iranian crude oil. "I would be hesitant to say zero waivers ever. I think the predisposition would be no, we’re not granting waivers," the official told reporters. How many barrels of Iranian crude can successfully be shut out of the market (as we've noted before, estimates before the U.S. comments have ranged from little impact to over a million barrels per day). How much increased output from OPEC and Russia can — or can't — mitigate potential price rises that have domestic political consequences in the U.S.
"[The] WHITE HOUSE can push Iran’s crude exports to zero, or it can have moderate oil prices, but cannot have both. Saudi Arabia, UAE and Kuwait likely do not have enough spare capacity to offset loss of all Iran barrels as well as Venezuela and other losses. White House must choose." "The US will face an 'extraordinarily difficult' task in cutting off all Iran oil trades, 'particularly if the US administration is still only in the process of conveying this message to Iran's oil purchasers,' said Elizabeth Rosenberg, director of the energy program at the Center for a New American Security." Go deeper: The Wall Street Journal looks here at the market response to the sanctions comments. Gas pipelines: Upton is bullish about House action on his bipartisan bill to boost DOE oversight of pipeline security against cyber and other threats. “I am in good standing with [House Speaker Paul Ryan] and it is something that I care about and I expect it will get done,” Upton said of the bill, H.R. 5175. Coal and nuclear: Upton offered absolutely no endorsement of White House plans to prop up coal-fired and nuclear plants. He stopped short of outright attacks, noting, "we have not seen the details." But Upton also suggested it might not happen anyway. “I saw it as a trial balloon and it didn’t get up very high,” he said, later noting "it does not seem to have strong legs." Climate: Upton doesn't support the proposal backed by several GOP elder statesmen like James Baker and Trent Lott that would impose a fee on carbon emissions. “I think there are some other ideas we can do, other than a carbon tax, that reduce emissions and create greater efficiencies, and I am committed to doing that, so stay tuned,” said Upton, a member of a bipartisan House climate caucus. Energy and trade: Upton is quite happy about the U.S. oil-and-gas surge, including the 2015 lifting of the crude export ban that he and others pushed, and generally lower consumer prices. But he's critical of White House trade policies, including metal tariffs that affect pipeline and auto costs, and signaled hope they're more of a tactic than the new normal. “Clearly we have benefitted from the renaissance of lower energy prices, making the U.S. a much better competitor with folks around the world,” Upton said. “We all want better trade deals and I hope this is some leverage to try and get there." The China risk: This new, wide-ranging piece from Columbia University's Center on Global Energy Policy looks at China's growing role in global natural gas markets, a topic we also explored here. What caught my eye: Their take on how the White House approach to foreign policy could affect U.S. LNG exports to China (beyond the risk of trade battles spilling into LNG, which hasn't happened yet). "Another set of political risks comes from the Trump administration’s willingness to reverse US policy on international agreements (such as the Iran nuclear deal and Paris climate accord) and disrupt longstanding alliances (such as with members of the G7)," write David Sandalow, Akos Losz and Sheng Yan. "Before signing long-term LNG purchase contracts, importers evaluate the dependability of an exporting country’s government, assessing the risk that the government will interfere with those contracts." "Although the Trump administration has been full throated in support of LNG exports to China to date, its lack of respect for prior US agreements and alliances raises concerns in many countries about the durability of US government support for any policy." Big Oil vs. Trump: The World Gas Conference happening this week in Washington has laid bare the oil-and-gas industry's angst about the very hawkish White House trade policies. Via Bloomberg, "Top executives from Exxon Mobil Corp., Chevron Corp. and Total SA all took shots at Trump’s trade plans at the World Gas Conference in Washington, expressing concern that U.S. tariffs are a risk to oil and gas demand, and that restrictions on importing steel could impede one of the country’s fastest-growing major industries." Axios' Andrew Freedman reports ... NASA chief Jim Bridenstine says he’s not getting pushback from Trump administration officials over his recent, high-profile endorsement of the scientific consensus that human activities are the dominant cause of global warming. "The administration has been very supportive of my position. Nobody's given me a hard time about it at all"
Why it matters: Bridenstine leads one of the world's top climate science research agencies, so his position on this issue will influence support for studies that in turn form the basis for policy decisions. Yet he's out of step with senior Trump officials, and is the only high-profile Trump appointee to support the scientific consensus on human-caused climate change once he got into office. "What I find, Republicans and Democrats can disagree about what to do about what we are learning, but everybody, everybody on both sides of the aisle believes that we should study and understand what is happening to the planet because it is changing and everybody knows that." Still, the Trump administration proposed steep cuts to NASA's climate programs in the next fiscal year. However, Congress restored most of the funding during the appropriations process. Going all the way: In May, Bridenstine became the sole Trump administration official to fully endorse the findings of the federal government's National Climate Assessment. Amy writes ... Oil and gas companies are increasingly focusing on how to cut emissions of methane, a potent greenhouse gas that’s also the primary component of natural gas. At a conference underway in Washington, attendees can try for themselves with virtual reality. Why it matters: With the world’s use of natural gas growing, determining its impact on climate change is key. While many people are familiar with carbon emissions, less awareness exists around methane. 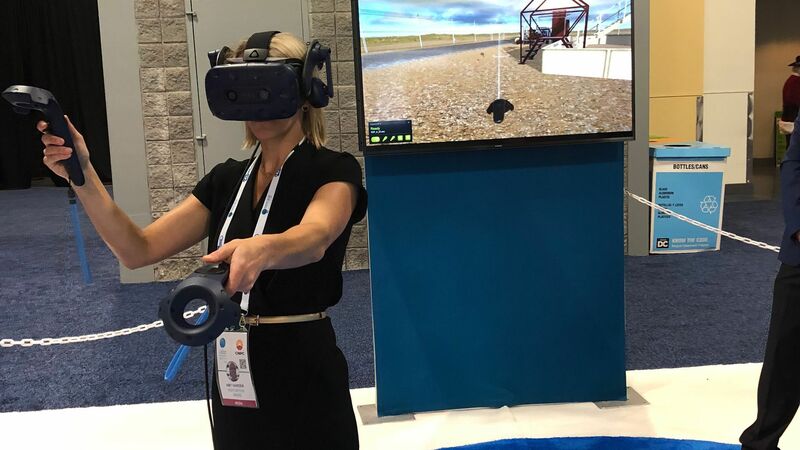 What's happening: A virtual reality exhibit by the Environmental Defense Fund at the World Gas Conference is aimed at making something intangible to most people seem less so — at least virtually. The intrigue: The EDF exhibit allows people to virtually experience what it’s like to be a worker at an oil and natural gas well site, monitoring and stopping leaks of methane. I had a chance to experience it during the conference’s first day Tuesday. You start in a spaceship that tells you about why methane emissions are important, and then a robot named Bella shows how you can transport yourself to an oil and gas well site. Go deeper: Click here for the rest of the story. Thanks for reading and we'll see you back here tomorrow.